Fill and preheat the SousVide Supreme water oven to 140F/60C. Wash and rinse the tongue, patting it dry with a paper towel, and put it into a large cooking pouch. Submerge the pouch in the water oven to cook for 24 to 48 hours. When ready to serve, pre-heat a cast iron skillet over high heat. Open the pouch and set the tongue aside. Pour the onion-garlic sauce (pouch liquor) into a small bowl. Set aside and cover to keep warm. Remove the outer covering from the tongue, then slice the tongue horizontally just past its widest point. Slice each section of the tongue vertically into pieces roughly ¼-inch (0.6 cm) thick. 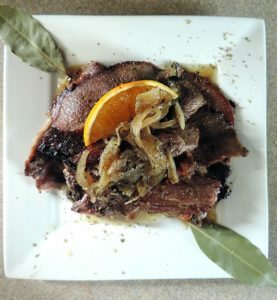 In a heavy skillet on the stovetop over high heat, sear the slices until browned, about 1 to 2 minutes per side.When ready to serve, top slices of meat with the onion garlic sauce, add a wedge of orange to each plate, and enjoy!